We tell you about the charm of Japanese firework. The big balls of light that burst out in the night sky, so fantastic and so artistic. This beauty that contains the essence of Japanese sensitivity can be called the splendid art of light that pacifies our hearts. The fireworks made by our professionals using the traditional techniques really become “fireworks” only when they burst up in the night sky. The charm of it is the fact that all of its color, shape and sound can be seen in just one moment. Spherical (round) shape. All fires form a regular round formation. The color of fires changes. Star is set in layers, so the color can be changed into any other color. There is a core. Inside a big tube there is a small one (a core), and it can be multiplied so the firework would have 3 or 4 cores. 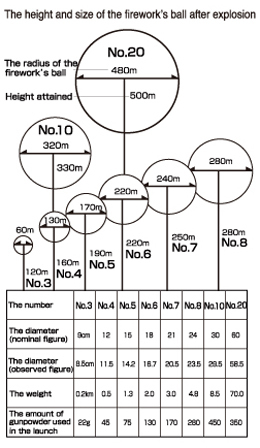 The way of naming fireworks size is in "numbers" or in "shaku", a traditional Japanese length measure. 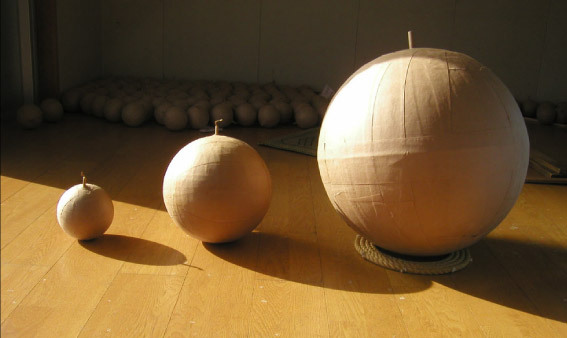 In a naming that comes from ancient times the standard of a size is "sun" (read as "soon"), which is a smaller measure from the same system with "shaku". 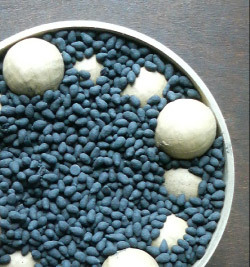 One sun is about 3cm so a 3-sun diameter firework ball is about 9 cm and is called No. 3 ball. A shaku ball is 10 sun or No. 10 ball, and 2 shaku ball is 20 sun or No.20 ball. Our company produces fireworks up to the size of No.20 or 2 shaku. If compared to a No. 10 ball, this No. 20 type is twice as large and more than twice as heavy. To set it up we use a crane for lifting and putting it down. On a picture below from left to right there are No. 5, No. 10 and No. 20 balls. We build our performances around the height on witch the firework rises and the diameter of the burst in order to put the charm of fireworks to the maximum extend. From left to right, No. 5, No. 10 and No. 20. 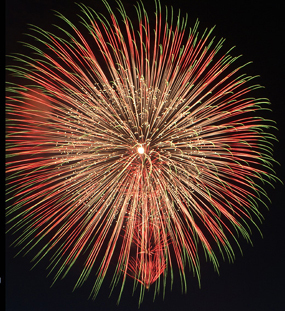 The size of a biggest fireworks that can be launched on a fireworks festival is set according to the “safety distance”. Safety distance means the distance from the launching area to the audience and the surrounding buildings that is safe. It differs in every prefecture of Japan. At a place where we can secure a wider safety distance we can set up bigger sizes. But in the city downtowns and other concentrated population places the size and the ways of launching are limited. Among places usual for fireworks are baseball or athletics stadiums, wave breaking moats, fields and just open wild spaces. If we can apply traffic restrictions we can also set up fireworks on roads. According to the local specifics such as high voltage lines or airport facilities there are places where fireworks are prohibited. Please feel free to consult us on the details. We will conduct an examination of the ground. Due to safety reasons the fireworks ignition is not conducted manually but generally by a remote electric ignition control device. In Japan such devise began to appear in 1980s, so we at Hokuriku Kako use such devices in order to secure the safety of our professionals and staff, and at the same time to secure the accuracy of show program. It is also possible to fully control the launching process by a computer. 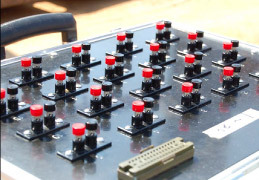 A totally remote control is possible, launching fireworks as fast as every 1/30 of a second. At the same time using computer operation makes it possible to stop launches by just one button, thus making the fireworks adjustable to rapid weather changes. Even in the rainy weather we can launch our fireworks since we do special water-resistance measures. Adjusting to rapid weather changes like strong wind we can also exclude only the selected fireworks out of the launching program, too. If a strong wind blows suddenly in the middle of the show, we can decide it is dangerous and let only the small fireballs launch, excluding the big ones. This can be done even while the actual launching program is running.